Okay everyone! Don't laugh at my mommy. I know she can look like a crazy goon some days but I promise she is a good mommy! So since its the day for meeting my family I am introducing you to Mommy as well. She is the one in that super bright shirt that doesnt walk on all four of her legs... She actually only has two legs!! The other two things (she says they are arms) spend a lot of time handing me yummy treats! (well and here you can see her giving "loves" and "snugglies". Well this is most of my family! Next week you all will get to meet my Daddy! Mommy told me today that "He is coming home a day early" which im not too sure what that means but Mommy is super excited. I just wag my tail so she thinks I understand what is going on! Okay today mom said that "I was stealing all of sissy's lime light".. whatever that means. 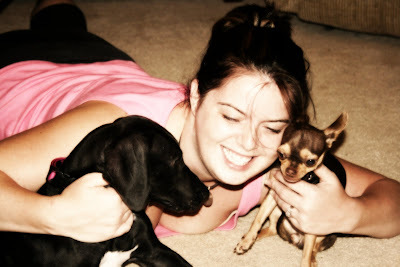 So I am going to post up a couple pictures of my sweet "little"-big sissy Teagan, The Chihuahua. This is Teagan as a tiny baby! Can you believe she was that size? I cant, because I dont think I was EVER this size!! Mommy calls her Teagan officially but sometimes she calls her Tinks, Tinker, or Tinker Bell; I dont understand why though! This is Teagan today. She is about 4 pounds and super tiny. Mommy makes me be super careful with her but Sissy is the one that nibbles at my elbows! She is so small that some people upset mommy by saying "do you feed her enough". Well everyone, Mommy takes great care of both of us and Teagan has this good thing called "Metabolism" that mommy is super jealous of! We are the best sisters ever and we even wear the same kind of collar! She is a year and 8 months here.. So she is a lot older than me but I keep up with her with my size. Sometimes I get super jealous of her because she is aloud to cuddle with mommy on places I cant go... They are called the "couch" and the "bed"... But mommy must have a reason, I just dont understand yet!! And here are a couple pictures of Sissy and Me together! So this is Sissy and me... As you can tell I am already way taller than her but im super gentle. Mommy says that Teagan has helped me learn that small dogs are fun but they need special kinds of play.. That means I cant be really rough with her, which hasnt been hard for me at all. I'm a little Dane, Short and Stout, I am growing Faster than a Sprout! Hello everyone! Well this is me, Nova (Scotia) Turner. Im a cutie little black Dane with white markings on my chest and paws. I have one little toe nail on my left front paw that is white and it makes me a little different than the other black and white danes I know. So, this is my face at 11 Weeks. Well Anyways, a little about me... Mommy and Daddy came and picked me up when I was 8 weeks old. I had to leave my two sisters and my brother but im super happy with my new mommy, daddy, and big-"little" sissy, Teagan, the chihuahua. Mommy and Daddy drove three hours to come get me and drove me three hours back so they really wanted me! I havent been at my real home a whole bunch because Daddy had to go on this huge ship thing so Mommy took Sissy and Me to Georgia to hang out with my "GG" (Grandma) and my "PawPaw" (Grandpa). They are super sweet. Since I have been in Georgia Mommy has been training me how to get treats by making her make this clicking noise. All I have to do is impress her with something that is super easy to do and she makes this click sound and gives me yummies! Mommy says im super smart and that I learn simple tricks in about 5 minutes and harder tricks within the day. Well I hope you enjoyed getting to know me a little bit. I will be on here a lot as im growing up so stick around to see me out grow all those little doggies! !